A former state trooper has pleaded guilty to a misdemeanor manslaughter charge in the 1965 slaying of a black man in Alabama that triggered a key march of the civil rights era. James Bonard Fowler, who is white, entered the plea Monday at Marion, two weeks before he was scheduled to go to trial on a murder charge for the death of Jimmie Lee Jackson. Jackson, 26, was shot during a civil rights protest that turned into a club-swinging melee. His murder inspired a Selma march that became known as "Bloody Sunday" when it was turned back by club-swinging troopers. The march helped lead to passage of the Voting Rights Act. 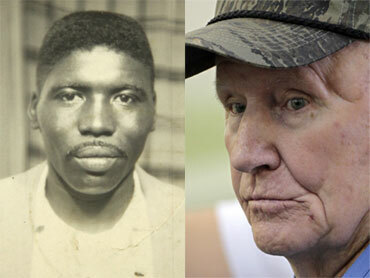 The 77-year-old Fowler was sentenced to six months in jail in Geneva County, his home county. Fowler was among a contingent of law officers sent to Marion on the night of Feb. 18, 1965. According to witnesses, about 500 people were marching from a church toward the city jail to protest the jailing of a civil rights worker when the street lights went out. Troopers contended the crowd refused orders to disperse. Soon law officers began swinging billy clubs, with marchers fleeing. A group of protesters ran into Mack's Cafe, pursued by troopers. The cafe operator said 82-year-old Cager Lee was clubbed to the floor along with his daughter, Viola Jackson, whose son, Jimmie Lee Jackson, was shot trying to help them. He died two days later. Fowler had contended he fired in self-defense after Jackson grabbed his gun from its holster. Shortly after the shooting, federal and state grand juries conducted reviews and brought no charges. District Attorney Michael Jackson, who in 2005 became the first black prosecutor elected in Marion County, reopened the case and took it before a county grand jury, which indicted Fowler on a murder charge in May 2007. Jackson, who died at a Selma hospital days after the shooting, is now honored in civil rights museums in Alabama as a martyr of the movement. Fowler, who apologized to Jackson's family after entering the plea Monday, said he didn't mean to kill anyone that night in 1965. "I was coming over here to save lives. I didn't mean to take lives. I wish I could redo it," he said. Defense attorney George Beck said Fowler agreed to plead guilty to the reduced charge because he was concerned he couldn't get a fair trial in Perry County and his health is poor. "He wants to put it behind him," he said. "It puts to rest a long chapter of civil rights history here in Perry County." The district attorney recommended the plea to the family. He said he wanted Fowler to acknowledge what he did, apologize to the family and serve some time behind bars. "This is almost like a death sentence for him at his age," he said. But Jackson's daughter, Cordelia Billingsley, said, "This is supposed to be closure, but there will never be closure." Fowler could have received a maximum sentence of one year. He will be on probation for six months after serving six months in jail. Some of those who were in Marion on the night of the shooting are dead, as are two FBI agents who originally investigated Jackson's death. News reporters were also beaten and cameras destroyed during the melee, with no pictures left of what happened. The shooting galvanized civil rights activists who had not been getting any national media attention in their efforts to register blacks to vote in Selma, said Taylor Branch, the Pulitzer-Prize winning author of "Parting the Waters" and other books about the civil rights movement. The Rev. 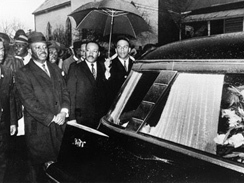 Martin Luther King Jr. arrived to preach Jackson's funeral (left), and in reaction to the killing, black civil rights demonstrators set out on March 7, 1965, on a march from Selma to Montgomery. They were routed by club-swinging officers at the Edmund Pettus Bridge at Selma, an attack known as "Bloody Sunday." National news coverage of the attack, including images of terrified marchers being beaten amid clouds of tear gas, made Selma the center of the civil rights movement. King, who was not present on Bloody Sunday, arrived to lead a weeklong Selma-to-Montgomery march later in the month. Those events prompted Congress to pass the Voting Rights Act of 1965, which transformed the political makeup of the South by ending various segregationist practices that prevented blacks from voting.